Pokémon GO is a phenomenon. And to an extent that I think Niantic and Nintendo scarcely could have imagined. Last night, my girlfriend and I walked down the street to have a nice dinner, and on the way there I counted four or five people clearly playing GO (several were walking their dogs). And of course I was playing some GO on our short walk home, too - using the $60 BLU R1 HD with Prime Exclusive Offers. This was day three with the R1 HD for me (previous post - day one and series intro - here), and it dawned on me that this $60 smartphone might well be the ultimate Pokémon GO burner phone. At least for the GOer with Amazon Prime. Granted, the AR view doesn't work - the camera viewfinder appears, but it won't place the actual Pokémon in view, so I have to toggle AR mode off. (Coincidentally, I have to say: it's much easier to capture Pokémon with AR mode off, and you don't have to spin around like an idiot every time you start an encounter.) But the GPS is fine, and the phone gets T-Mobile and AT&T LTE. If you're a Project Fi subscriber, you could even pop a Fi data-only SIM into this thing and it wouldn't cost you anything extra a month, just $60 up front for your own personal LTE Pokedex. You could just tether to your "real" phone, too. 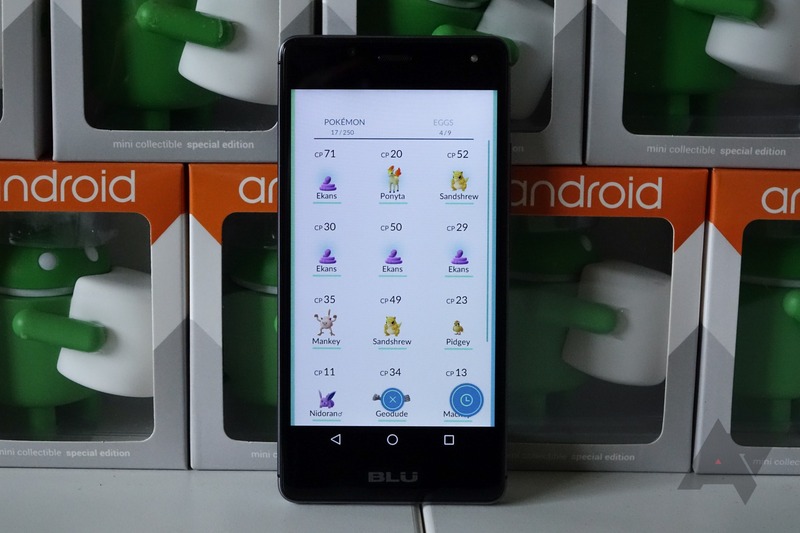 Other thoughts on the BLU R1 HD at this point (i.e., non Pokethoughts)? It's definitely starting to be a bit more apparent that this isn't a very fast phone. It was chugging hard last night when I was trying to look up the address of the restaurant we were going to in Google Maps, and that was a kind of frustrating moment. It also got stuck on HSPA (3G) until I manually toggled airplane mode on and off, and when it was on 3G, the data was basically unusable. It's possible this is a radio bug. I popped in a second AT&T LTE SIM to test the dual SIM mode, and it works, though the non-data SIM is always in 2G mode - only one SIM can be 3G/4G (either SIM can be set as the data SIM regardless of its physical slot). I also noticed that, even with the second SIM disabled in software, my battery life went off a cliff, so I removed it, and it's since back to far more acceptable levels of performance. Which, at this point, seems basically like what I'd expect of phones circa 2014-15. It's not terrible, it's just not outstanding, either. I've made a few phone calls on the R1 HD and had no issues, though I'd admittedly prefer a slightly louder speaker on the earpiece. The Wi-Fi range on this phone continues to be truly awful, to the extent that I disable it when using the phone in my bedroom, where even AT&T's sluggish LTE network provides much better speeds. The screen's blue tint is also positively retina-searing in the dark, and I've often found myself manually adjusting the brightness as a result. But as we walked home in the dark, a wild Mankey appeared, and I pounced. Success. My girlfriend - lovingly - rolled her eyes. $60 for this much fun almost seems wrong. This post is part of an ongoing series in which I use the $60 Amazon Exclusive BLU R1 HD as my primary smartphone for a month. The entire series will be available at this link (tag "amazon prime phone"). Day one post here. Weekend poll: are you playing Pokémon GO?